Emit ECard gives split times and chip timing for all sort of sports. The emiTag is an active timing chip with a built-in radio transceiver and uses wireless technology to communicate with a range of readers. emiTags are suitable for a variety of sports, where you want to record times and identity competitors. The chip has many advanced features; two-ways communication, large flash storage, a powerful LED (that flashes when the emiTag detects a control or eLine signal) and a state-of-the-art lithium battery. For simple races a yellow box, with a built-in aerial, can be deployed to read the emiTags as they cross any finish line, the box has a range of 3-4 metres and can be read into the event database either as competitor’s finish, or downloaded later. These boxes can also be placed at points around the course for split times, as a back-up, or to ensure competitors pass certain points on the course. Alternatively, a smaller paddle type control with a 75 cm range can be used where competitors numbers passing through a control at any one time are in single figures and the competitors can be instructed to ensure they register a pass/read on the control (this option is used mainly for Ultra/Adv Races, MTB and increasing for orienteering). Note most orienteering events use our original card system where the card is carried by the competitor who places it on each control as they progress around the course and then it is downloaded after the finish control to give a splits print showing times for each control visited. For larger races a timing loop can be put up on an arch, or placed under mats, to give a greater width to a finish line. If accuracy on the line is required below the standard 10th of a second then, two loops can be deployed for accuracy to 100th of a sec, this method is often used in ski races or for cycling events. 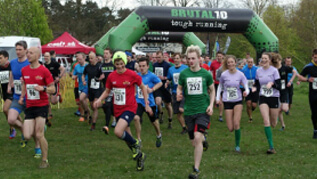 The emiTag is permanently on and therefore there is no need for a reader on the start line as timing can be based on a pre-entered race start time, otherwise known as the Gun-time start method, which is agreed with organisers before the event, the actual start time can easily be advanced or delayed as circumstances dictate. However, if a net-time/chip-time is required for the competitors a box can be set on the start line to zero the emiTag as the competitor crosses the start line and that enables us to give each competitor an individual run time based on when they actually crossed the start line, this is normally used for running events with over 1000 competitors, where it can take over a minute for them to cross the start line. Alternatively, this method can also be used for staggered start events, where competitors either go in waves, or are allowed to start anytime during a specific window. emiTags are waterproof and therefore can be used in Triathlons/Aquathons, as well as obstacle runs and any event where the competitor will be entering the water. “Emit-UK Timing Ltd” offer a range of timing options for road races. Basic Timing. This is based on the gun time where competitor is timed at the finish only. Can be used for a range of distances with different start times and competitors in a range of classes. Organiser provides entry data in a spreadsheet for upload to an event database and Emit-UK supply emiTags for issue at the event, or just before the event, normally to match with Race/Bib number. Emit-UK will collect etags on the finish line. Basic results display can be provided on screen at the finish showing times for all recent finishers, or paper results can be printed at regular intervals. 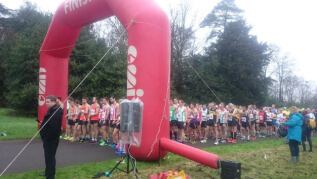 Increasingly we are providing live online results hosted on our www.race-results.info website and these can be viewed by competitors at the event using either their own smart phone or our touch-free screens. If necessary pdf, csv, excel, doc, or html results can also be emailed to the organiser. Although cut and paste direct from the race-results if increasingly the preferred option. As with road races the emiTag System can be used for any distance or format of x/c race. Being fully waterproof the elements are not an issue and the tag is normally worn of the wrist rather than the ankle making it easier to spot, it also stays cleaner and is easier then to recover from the competitor as they collapse over the line. Having it on the wrist also means they can punch in at intermediate timing stations and get positive confirmation of that read by viewing the tag flash. If the timing box or loop are at waist or above head height it is also better to have the tag worn on the wrist. The emiTag System is ideal for both time and pursuit races, as well as for team races where the tag can become the baton. The emiTag system can be used to time competitors on adventure races where the short-range touch free controls(75cm) are ideal for recording progression around a course, with the competitor able to confirm a pass at each control when the LED flashes for 5 or 10 secs. Alternatively, larger yellow timing boxes can be deployed as stand-alone timers with a 3-4 metre range and then downloaded later or reads pulled from our server. Both these systems can be coordinated with a web-based tracking system where Emit-UK have a proven partnership with Open Tracking Ltd who provide a web based tracking display solution. Again, the emiTag system is ideally suited for Ultra races where the touch-free controls can be combined with an arch finish. Competitors can either have the lightweight emiTag on their wrist, or in a pocket or rucksack pouch. The emiTag flashes as they pass a control at a water point, or even at an unmanned checkpoint to confirm a recording. Individual splits print can be provided at the finish line and full splits results can be printed out at the event and further posted to a website. If required remote monitoring of passage through CPs is possible using either modems in the larger yellow boxes or small radio transmitter boxes that read and relay every read on the smaller TFP paddle type controls. These are simple to operate with just an on/off switch which makes it easy for event staff to place along with the TFP controls which also have a simple on/off mechanism. Whilst the emiTag system can be used for longer endurance type events, it is not our preferred system for this type of race, the main reason is that whilst the emiTag is permanently on it will reset to zero after 3hrs 42 minutes if it does not register a control. For longer races where the distance between controls is over 3hrs we prefer to use the original Emit ecard system where the competitor carries an ecard and makes physical contact with a control at each CP. This is the standard system used worldwide for orienteering events. Ecards can record up to 50 controls and come with either an LED clock display which shows time progression as well as giving positive confirmation of a punch, or the latest version 6 cards come with a light that flashes for 5 secs after a punch. The system comes with a generic set of software that can cater for all types of events, including laps and enduros. Alternatively, we provide bespoke software for certain activities, which includes the option of recording reads yourself and then downloading and emailing the files to Emit UK who will produce the results. There are also a few free software alternatives available which organisers can make use of and then hire eqpt from Emit UK Lightweight and easy to carry the emiTag can easily become a baton by wrapping around, or inside a baton. Robust and waterproof it works at extreme temperatures.